In Catch! 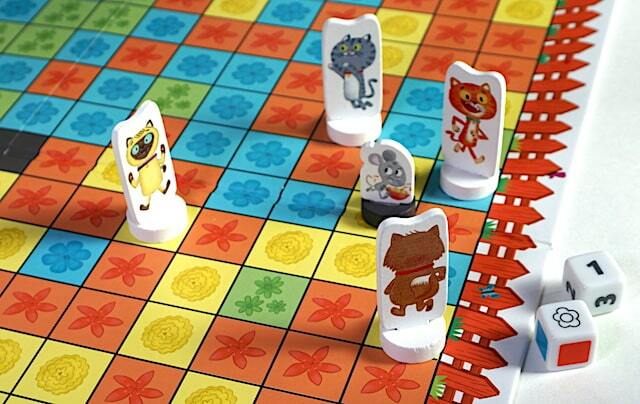 from Peaceable Kingdom, players work together to move 4 cats to surround a mouse and keep it from escaping the yard. Listen to our family’s thoughts in 5 minutes, or read on below. Set up the board. Put the mouse in the middle black square, and the cats at the four corners of the board. I’m going to get you, mousie! Grab the dice and roll them on your turn. One die has colored squares and represents how the mouse moves. The other die has numbers determining how the cat(s) move. 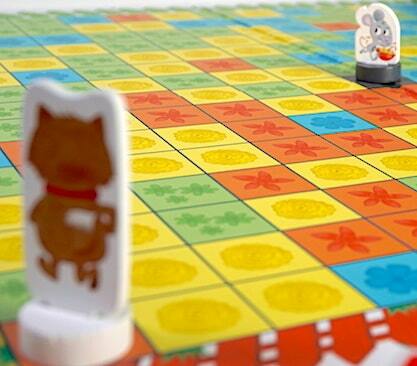 Most times you will only move 1 cat on your turn, but if you roll “All Move 1”, move each cat a single space. Your goal is to keep moving the cats to be able to surround the mouse and keep it from successfully moving off the edge of the board. There’s some strategy here, to align the cats so that if the mouse tries to go in a particular direction, it will be blocked. Don’t let him get away! If you’re searching for something to play with non-gaming family that includes children, Catch! is easy to understand and play together. It’s a simple game, with simple mechanics. The strategy is easy to understand and explain, and we’d recommend it for this reason. Buy Catch! on Amazon, or ask for it at your local toy store. 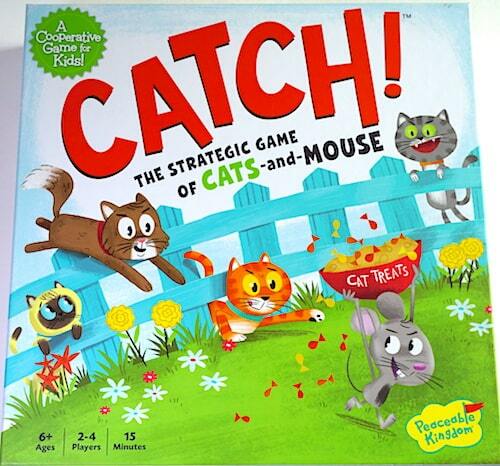 The Family Gamers received a copy of Catch! from Peaceable Kingdom for this review.